I’ve known that there was a zoo in Central Park for probably as long as I’ve known that there was a Central Park. I wasn’t sure where it was, but I suspected it was close to the center, pretty much where it turns out that the reservoir is. I don’t know why I imagined it was there. Partly it might be because it seemed that a zoo should take up a pretty decent amount of space, I think, and tucked away in a corner didn’t seem like it would be big enough for a zoo. The movie Madagascar didn’t help that notion, by the way. Animals like lions, zebras, hippos, and giraffes need lots of space. According to the Association of Zoos and Aquariums Lion (Panthera leo) Care Manual, a lion needs at least 0.22 acres. That’s just a little smaller than the average lot size for a home in the American suburbs. Turns out that the Central Park Zoo doesn’t have any lions, zebras, hippos, or giraffes. There isn’t enough room for them. Just about the only parts of the zoo in the movie that look like they do in real life are the sea lion pool, which really is in the center of the zoo, and the clock with the arches underneath it. The clock, called the Delacorte Clock, is off to one side, rather in the middle. In fact, while researching this post, I found that the zoo from the movie is more similar to the zoo as it was before they remodeled it in the 1980s. The brick buildings with the arches and the enclosures with bars are very prominent in pictures from before 1980. 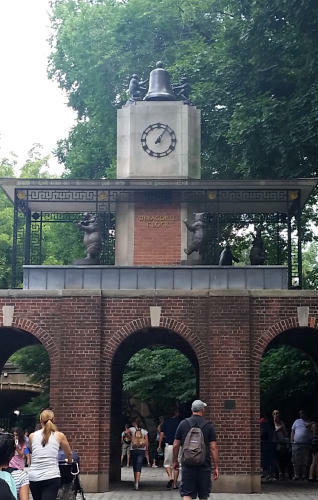 The Delacorte Clock, Central Park Zoo. The history of the Central Park Zoo goes back to the mid-19th century when a bear cub was given to a messenger boy who worked in the park. Eventually, park employees collected other animals, and the city formed a menagerie. There was nothing like a menagerie or a zoo in the original plans for the park, which the architects, Frederick Law Olmsted and Calvert Vaux, had made. Vaux suggested the menagerie be moved to the perimeter of the park between 77th and 81st Streets, where the American Museum of Natural History stands today. Olmsted suggested putting the zoo in the North Meadow. They broke ground for the new menagerie, but after the first foundations were laid, construction stopped and the menagerie ended up in the building that had previously held the arsenal for the New York State Militia, in the southeast corner of the park. I wonder if there are any kind of cropmarks visible where those old foundations were laid. I recently had the experience of seeing a sort of cropmark (though from the ground level) in Lockhart State Park, and can’t help but think that there might just be some kind of difference in the grass of the North Meadow where the old foundations are under the dirt. In 1934, the haphazard menagerie that had accumulated in Central Park was replaced by a new six-acre zoo, which was constructed in less than a year. The centerpiece of the new zoo was a sea lion pool, which is still there today. The sea lion pool was unusual for the era, because the designers looked at the way that sea lions live and designed it accordingly. These days, ideally every zoo has habitats designed in a similar way (though the San Antonio Zoo has fallen behind just a bit on that score — more on that in a future post). In the 1980s, they renovated the zoo, getting rid of the old enclosures with the bars and designing new habitats that were more in keeping with the ways the animals live in the wild. This is also the era in which the zoo got rid of all of its large animals, sending them to zoos that had more space and could better care for them. The only large animals they kept were a pair of polar bears, each of which were euthanized when they developed inoperable tumors. The old polar bear habitat was later renovated and now houses two grizzly bears. The current zoo, which opened in 1988, houses over 130 species in its relatively small area. One of the most popular, from what I saw when I was there, were the penguins. There was barely room to move in the penguin house and this is likely for two reasons. One, of course, is, as mentioned before, Madagascar (though we never did see the penguins smile and wave). The other is that for a time the Central Park Zoo’s penguin habitat had a gay couple, Roy and Silo, who made the news and also were the subject of a children’s book, And Tango Makes Three, about Roy and Silo raising a chick together (which also made the news). Roy and Silo split up when Silo fell for a new, female, penguin. The zoo layout is kind of erratic. Visitors enter from the southwestern side and then the visitors go around the central part of the zoo, the Central Garden, in a clockwise direction. There are a whole bunch of exhibits behind the western part of the Central Garden. Somehow, following the natural flow of the zoo ended up with us missing the turn for the red panda exhibit, so once we were done with the penguins (which should have been the last stop), we looked at the map and had to backtrack to the turnoff for the pandas. Overall, though, it is a very nice zoo considering the space they have available (I do wish the red pandas had a little more space). The layout and traffic pattern of the zoo, combined with the fact that we had to backtrack, led me to completely miss the Arsenal Building that used to be the home of the menagerie. I didn’t even get an accidental picture of it. I quite liked the Tropic Zone building. It had a lot of birds and also had a nice little display of short-tailed fruit bats. I love bats. It’s always fun to watch them fly, and they eat mosquitoes. Anything that eats mosquitoes is my friend. The Central Park Zoo is quite hilly. This means that handicapped visitors might need additional assistance to get to some of the exhibits, and others might be off-limits entirely, depending on the wheelchair user’s stamina (and possibly his or her concern for the laws of gravity). The Central Garden and all of the buildings of the Central Park Zoo are wheelchair accessible. When my parents and I went to New York City in 1988, we spent part of one day in Central Park. As I recall, we walked up the west side of the park to about 79th Street, then walked across the park. We thought about going into the Metropolitan Museum of Art, but decided against it because the recommended entrance fee was too steep. Then we went to a Czech restaurant (I think it was Vasata, which is now closed) and then back down the east side of the park and back to our hotel. This little bit of exposure to the park (which was not nearly as frightening as books and movies of the 1970s and early 1980s had led me to believe it should have been) only whetted my appetite to explore the whole thing. 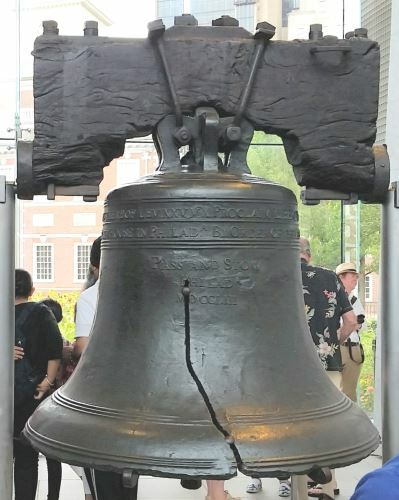 As a result, when we went on our 2015 vacation, I set aside one whole day to explore the park. On the walk from our hotel, I gave Alex just a smidge of the history of the park. I talked about how Frederick Law Olmsted started with smaller trees, with a view towards how they would look when they became bigger trees. We had just seen some more of Olmsted’s work in 2013, when we went to the Biltmore Estate (more on that in what will probably be a couple of weeks when I get to our past North Carolina trips). I also told him that they’ve filmed a bunch of movies, television shows, and commercials in the park and that it’s likely that he’s already seen parts of Central Park but was unaware that was what he’d seen. My plan was to walk up the west side of the park, visit The Cathedral Church of St. John the Divine, and then walk down the eastern side of the park. As fate would have it, however, Alex was not feeling 100%, so we ended up having to change our plans a bit. We started out at Columbus Circle. My original hope was to make it all the way around before the zoo closed and then visit the zoo. My top walking speed is around four miles (6.44 kilometers) per hour, but about two miles (3.21 kilometers) per hour is a good, comfortable, walking speed for me. If we were able to keep it around two miles per hour, we could do the entire park, or at least the outer edge, in around three hours. With stops, that might go to four or five hours. If we started at around 10:00 a.m. we’d be back to the zoo by 4:00 p.m. easily, even taking an hour off to explore the church. That would give us at least an hour to explore the zoo, which would be more than enough time. Once we started out, though, Alex ended up wanting pretty frequent rests. So we bumped the zoo up to the beginning of the day, since I didn’t think we’d get around to the other side of the park at all that day, and certainly not before the zoo closed. 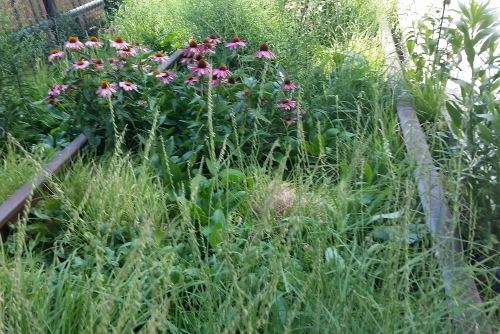 So we walked a path parallel to 65th Street and went to the zoo (which will get its own entry). After the zoo, we walked a path on the other side of 65th Street, along the Sheep Meadow, on the way back to where we started from, and then took a break to have lunch. I in no way felt like I looked good enough to go into the Tavern on the Green, but they have this little Green to Go carry-out place with its own little patio. We ordered their version of a BLT (though without either mayonnaise or avocado, since neither of us like them), which comes on ciabatta bread. We then had a nice lunch on the patio before heading out into the park again. We made a very serendipitous wrong turn at the intersection of West Drive and Terrace Drive. I missed the part where West Drive goes back north and we ended up by the Bethesda Fountain. I love the movie “Godspell,” so I always have a special fondness for the Bethesda Fountain and the lake, which are the locations of the baptism scenes. I spent the rest of the day “God Save the People” stuck in my head. There were some kind of street performers doing a thing there, and Alex wanted to watch for a while. Once we were done at the fountain, we took Terrace Drive back west and caught West Drive going north again. At about 85th Street, we took a path that led out of the park. Turns out Alex was just about done with the park, so I negotiated a compromise. 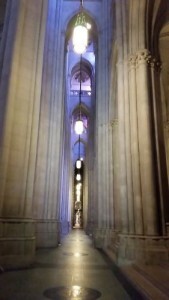 I really wanted to visit St. John the Divine, so I offered that if we took the street level those last 24 blocks and did the cathedral, we could take the subway back to the hotel. He agreed to this and so we stayed on the street until we reached 110th Street. Our final full day in New York was a sort of flex day, when we were able to catch up on things that we had missed the rest of the week. We returned to cover the east side of the park on that day. It was unseasonably hot (the heat index was over 100 degrees Fahrenheit (37.8 Celsius) and we had already done the Circle Tour (more on that later, as well) in the early part of the afternoon, so we needed to go back to the hotel to cool down for an hour or so. 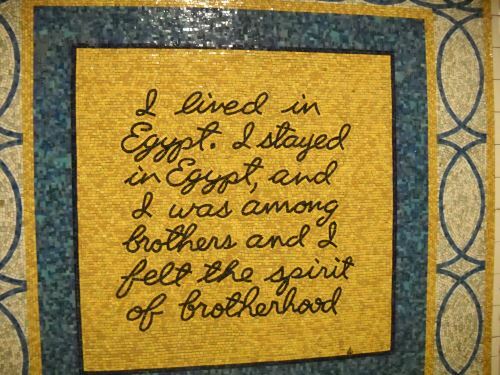 I also knew that I wouldn’t feel much like walking from our hotel and the park then the length of the park to get to 110th Street and then walk that same distance all over again in that heat, so we once again hit the subway. We took the 2/3 train to 110th Street and then walked around the north side of Harlem Meer and then south down the paths that paralleled Fifth Avenue. As the day got later, I was more reluctant to get too far from Fifth Avenue. The park is safer than it was back in the 1970s, but I was not enthusiastic about being in there too long after dark. As it turns out, we emerged at 59th Street just about sunset, so we still had quite a bit of sunlight left for me to take a few final pictures before we headed back to our hotel. Along the way, we passed the Untermeyer Fountain, the Conservatory Gardens, the reservoir (I took pictures while Alex once again rested). We saw the Guggenheim Museum and the Metropolitan Museum of Art, but both were closed when we were there. This was actually fortunate. There is no way that we would have had the energy to do either museum justice, so since they were closed, I feel no guilt about passing them up. 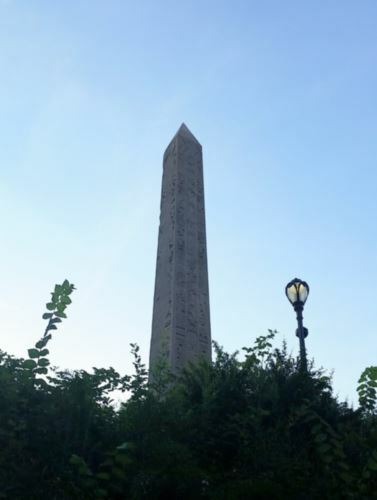 We took pictures of the obelisk that is one of the three known as “Cleopatra’s Needle” (I have now seen all three of them) and stopped for a while at Conservatory Water (the model boat pond) and the Alice in Wonderland and Hans Christian Andersen statues. As we left the park for the day we passed, once again, the zoo. The zoo was also closed, so it was nice that we went to the zoo that first day. We also noticed that the gates of the Park have names. We first noticed this at the Engineers’ Gate (which is where Alex rested while I took pictures of the reservoir), and then again when we passed the Artist’s Gate. It turns out that the gates had always had those names, given to them to reflect the people who would hopefully make use of the park, but that no signs had been put up reflecting these names until the 1990s. I wish I could say that I got enough of Central Park in those two days, but I didn’t. I still have never seen the northwest corner or the center of the park. Fortunately, Central Park is not going anywhere. I will get back someday and then, finally, I may have seen enough of Central Park. For the first time, at least. When I went to New York City with my parents in 1988, we visited the Empire State Building. I not only enjoyed the view of the city, I was very impressed by the detail that went into the building. This was a building that exists not just to be a place of business, but also to impress its visitors. And it does this very well indeed. So, when I started planning Alex and my 2015 vacation, I knew that I had to visit the Empire State Building again. 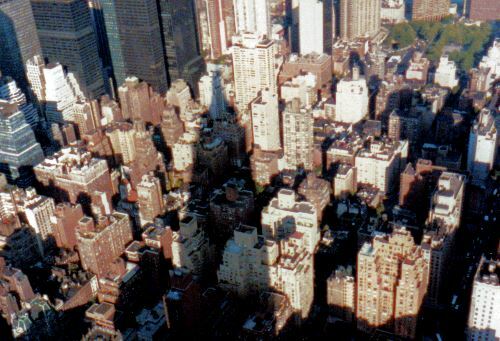 Additionally, my 1988 visit was in the evening and I took a picture of the shadow of the building stretching out over Manhattan. 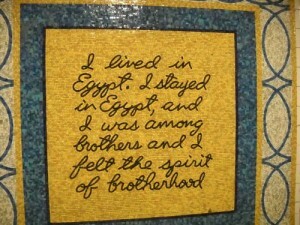 I wanted to duplicate that photo on this trip, as well, so as to see how the city has changed over the last 27 years. We went the same day as our trip to the Intrepid Museum and needed to get some rest and cool off a bit after all of the walking we’d done that day. As a result, we ended up arriving at the observation deck of the Empire State Building about an hour later than it had been when we had been there in 1988. I got the picture, though. The 1988 picture was pretty overexposed, and so I attempted to fix it. I’m still really new at this, so it’s probably not the best job ever, but it’s not too bad for a beginner. I think. The view from the Empire State Building at around 5:00 p.m. on, near as I can figure, August 16, 1988. The view from the Empire State Building at around 6:00 p.m. on July 16, 2015. The groundbreaking of the Empire State Building was held on March 17, 1930 and the building was officially opened on May 1, 1931. An additional 200 feet of height were added to the building so that it could serve as a docking station for airships (zeppelins, blimps, and similar craft). However, as fate would have it, the airship was supplanted by another technology — the jet airplane — and the closest any airship ever got to docking at the Empire State Building was when an airship tied to the mast for three minutes in a high wind. And, when it comes down to it, that was the downfall of the plan to use the Empire State Building as a docking station for airships. The wind is too strong at that height. However, the Empire State Corporation did get their extra 200 feet, and for over 40 years, from the opening of the building until September of 1973, when the Sears Tower opened, the Empire State Building was the tallest building in the world. The Empire State Building is open from 8:00 a.m. until 2:00 a.m. Visiting the Empire State Building Experience website will give you the estimated time from the front doors to the 86th floor. Visitors are required to take the elevator to and from the 80th floor, but from that point, visitors have a choice between taking the elevator and walking the last six stories. My son and I chose to climb the stairs, and I think we may have climbed the stairs in 1988 as well. For all I know, you get chilled champagne and a mani-pedi on the elevator between the 80th and 86th floors. I don’t think I’ve ever been in it. The Empire State Building is wheelchair-accessible. There are areas of the 86th Floor observatory where the walls have been lowered to allow wheelchair users to enjoy the view. As of this writing, the walls of the 102nd Floor observatory are high, but they are attempting to remedy that shortcoming. I actually considered having Alex, the family airplane enthusiast, write a guest post for me for this one. During June, as I was planning our vacation, I saw a reference in something unrelated to the vacation that one of the Concorde passenger planes was in New York City. “How interesting,” I thought, “New York City is a big place, though. It might not be anywhere near where we are going to be.” When I looked it up, I discovered that the Concorde’s home is now The Intrepid Sea, Air & Space Museum (which I will refer to from here on as “The Intrepid Museum”) and that not only do they have a Concorde, they offer special tours of it. I knew then that Alex and I had to at least visit the museum, even if we weren’t able to do any of the special tours they offered. As fate would have it, we were allowed to do one of the special tours. But I’m getting ahead of myself here. The Intrepid Museum is housed in the Intrepid, a World War II-era aircraft carrier berthed at Pier 86 on the Hudson River. Four decks of the Intrepid: the hangar deck, the gallery deck, the third deck and the flight deck, are open to the public. The hangar deck of the Intrepid is pretty typical museum, with exhibits and artifacts around the themes of the museum. The third deck has been restored and is designed to give you an idea of what life was like for the sailors who were stationed aboard the Intrepid. The flight deck is where we spent most of our time on board. This is where most of the aircraft on display are located. The fore part (you can tell that I’m hip with the nautical lingo here) of the deck holds aircraft that are out in the open. The aft part holds a tent where they restore aircraft, and which is open so that the public can see what they are doing, and the space shuttle pavilion. The space shuttle pavilion is a permanent structure that holds, you guessed it, a space shuttle. The space shuttle that is housed at The Intrepid Museum is the very first space shuttle built, the Enterprise. They used the Enterprise to do tests in the atmosphere, and they intended to add things like engines and bathroom facilities later so that it could go into space. As fate would have it, when they were building the second shuttle, Columbia, they made changes to the design of the shuttles and NASA decided that it would be too expensive and time-consuming to make those changes to the Enterprise. As a result, the Enterprise is the only space shuttle that has never gone into space. There are two exhibits that are not on or in the Intrepid itself. One is a submarine, the Growler, which dates to the Cold War era and is the only guided missile submarine on public display. Unfortunately, the lines for the Growler were prohibitively long and so we ended up not being able to get in to see the submarine. However, we did have the chance to spend quite a bit of time around (and, courtesy of the guided tours offered at The Intrepid Museum, inside) the Concorde. The Concorde that The Intrepid Museum has in their collection is G-BOAD, a British Airways plane, which is something of a celebrity, as airplanes go. I’ll try to avoid the infodump, but G-BOAD holds the record for fastest crossing of the Atlantic by a passenger jet going both directions. G-BOAD (commonly known as Alpha Delta) was also the only Concorde to be painted with the markings of an airline other than either British Airways or Air France. This airline was Singapore Airlines and G-BOAD had British Airways livery on the starboard (right) side and Singapore Airlines livery on the left (port) side in 1980. By the time the plane was retired in 2004, both sides had been painted with the then-current British Airways livery. Our guide was very informative and the tour was well worth the extra $20 per person to me, and I am not the airplane enthusiast in our family. The Intrepid Museum is largely wheelchair-accessible. I say “largely,” because neither the Growler nor G-BOAD are wheelchair-accessible. The only places aboard the ship itself that are not wheelchair-accessible are the Fo’c’s’le and the Combat Information Center. And if the Intrepid Museum has provided you with enough metal for one day and you are craving some green time, the next pier over, Pier 84, has been converted into a public park. There is a dog park, a playground, kayaking lessons, PD O’Hurley’s restaurant, and water taxi access all available at Pier 84. Piers 86 and 84 are on 12th Avenue between 46th and 43rd Streets. My son is in high school and social studies is not his strongest area generally. It wasn’t my strongest area either when I was his age, so one of the things I attempt to accomplish on our vacations is to give him “hooks” to hang historical information on. To that end, after we finished the Statue of Liberty/Ellis Island cruise, we went off in search of Federal Hall, the location (but not the building) where George Washington took his oath of office when he was president. The first governmental offices of the United States government were located there, as well. 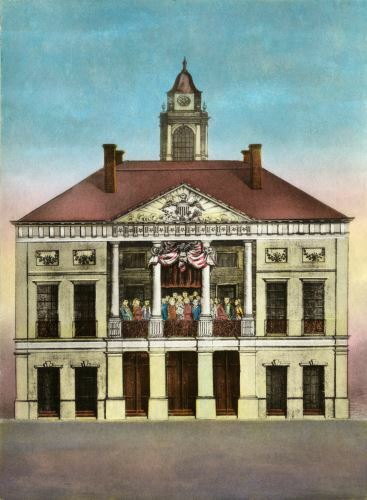 I found a public domain image of the original building that was on the site. The original Federal Hall. This image is in the public domain and came from the Library of Congress archives. Along the way, we talked about the financial district and the sorts of things that the firms there do. We passed the Charging Bull statue and discussed how the city put a barricade and an armed guard around the statue to protect it from the Occupy Wall Street protestors. As we got closer to Federal Hall, I realized that Federal Hall is kitty-corner from the New York Stock Exchange building, so that was convenient. As important as the NYSE is in our culture, I’m not sure I would have gone out of our way to see it, as we were exhausted by then. We were able to drag a bit more walking out of ourselves by heading up towards Ground Zero (the directions we got from Google Maps were confusing and didn’t quite lead us to the right place, but we ended up pretty close), and then we headed toward the nearest subway station back to the hotel, which, as it turned out, was City Hall/Brooklyn Bridge. 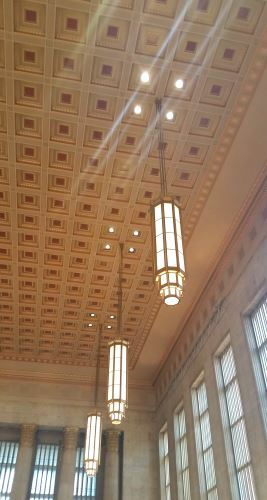 I got a bit of a second wind when I was seized with a yearning to see if I could find the skylights for the old City Hall station. We walked around City Hall once (they were doing construction of some sort, so I didn’t even get to see the cement pad that they put over the skylight) and off to the subway station we went. I also got to see the Brooklyn Bridge, at a distance, for the first time in my life. When we got back to our hotel, I told my son never to let me walk that far in one day again. His response? “I tried.” And he really did. And we did do more walking that evening, once we recovered a bit. 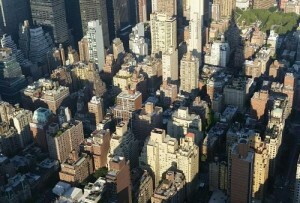 There’s no point being as close to Times Square as we were in our Midtown hotel without exploring. By the time we went to bed, we had walked 12.25 miles, which was a record for the nine months since I found the S Health app on my phone (more on that in a future post), and may well have been close to a lifetime record as well.